Copyright © 2018 NanoString Technologies, Inc.
NanoString provides life science tools for translational research and molecular diagnostics. The nCounter® Analysis System offers a cost-effective way to easily profile the expression of up to 800 DNA, RNA, or protein targets, simultaneously with high sensitivity and precision. Because the platform does not require amplification or the use of enzymes, challenging samples like post-mortem formalin-fixed paraffin-embedded (FFPE) tissue can be reliably analyzed to yield reproducible results. In contrast to technologies that require extended bioinformatics analysis, NanoString's digital read-out and data analysis tools put the biological understanding back in the researcher's hand and expedite the time from experimental design to discovery. 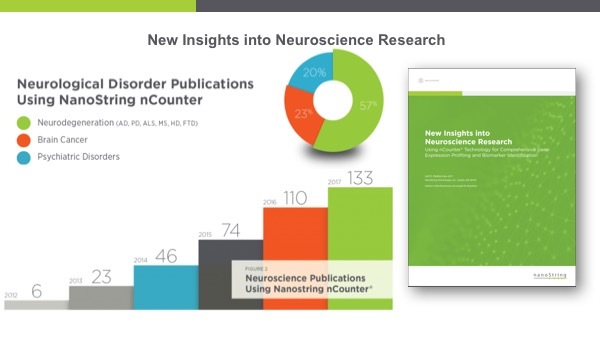 Researchers have demonstrated the power of the nCounter platform to generate robust results from CNS tissue, peripheral blood, and induced pluripotent stem cells. 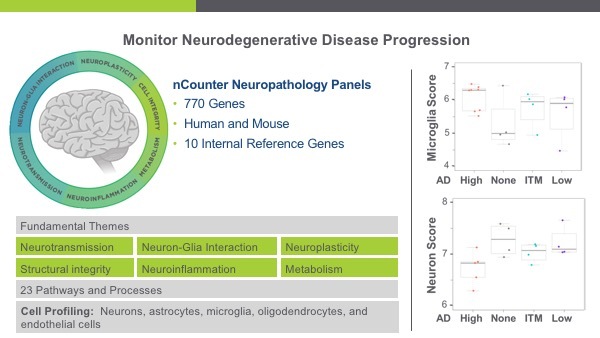 nCounter® Neuropathology Panels: Perform comprehensive analysis with 770 genes covering six fundamental themes of neurodegeneration: neurotransmission, neuron-glia interaction, neuroplasticity, cell structure integrity, neuroinflammation and metabolism. 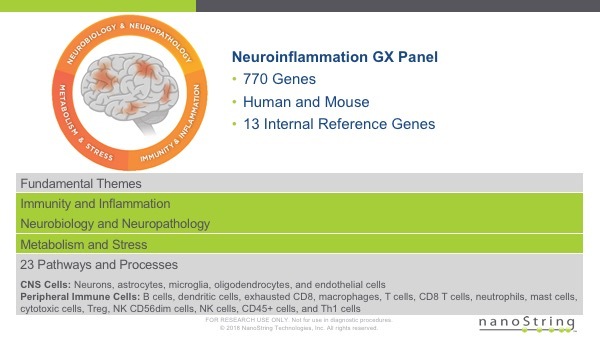 nCounter® Neuroinflammation Panels: Perform comprehensive analysis with 770 genes included for assessment of 23 neuroinflammation pathways and processes and cell typing analysis of 19 CNS and peripheral immune cells. GeoMx™ Digital Spatial Profiling: Digital Spatial Profiling (DSP) is a novel platform developed by Nanostring based on the nCounter barcoding technology to enable spatially resolved, digital characterization of proteins or mRNA. NanoString currently offers a neuroscience focused protein panel through the DSP Technology Access Program. Custom Solutions: NanoString offers custom solutions to suit a wide range of projects and plex needs designed for any organism with a known sequence. For genomics applications, NanoString’s bioinformatics team can perform designs based on public databases or user-provided sequences. For protein applications, NanoString offers options to build assays based on user-provided antibodies.